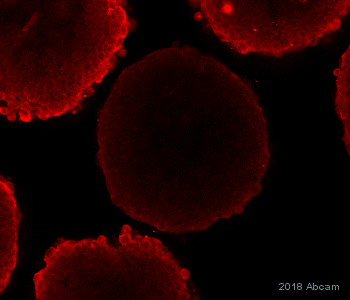 This antibody reacts with an epitope (PEDGIHELFP) located in the ED-A sequence of cellular fibronectin (it therefore only detects the cFN and not extracellular FN (plasma FN)). (Liao et al.) The ED-A segment can be included or omitted from the molecule depending on the pattern of splicing of the mRNA precursors. In transformed or tumour derived cells the ED-A segment is about 10-times higher than in FN from normal fibroblasts, and it may therefore be a significant marker for malignancy (Borsi et al., and others). Recombinant fragment corresponding to Human Fibronectin aa 1631-1721. Sequence of the type III repeats termed EIIIA (or ED-A). Liao et al: Clone IST-9, binds to the Ile43 and His44 residues within ED-A in a conformationally dependent fashion, implicating the loop region encompassing both residues as critical for mediating ED-A function. The conformational domain C-C'-E of rat EIIIA encompassing the His44 residue is crucial for constituting the IST-9 epitope. Positive controls listed in abreviews: WB: Human dermal fibroblast whole cell lysate, treated with TGF beta 1. Human platelets ( treated with ADP for 30 minutes). IHC-P: Canine myocardial infarct. tissue. Rat kidney tissue. Human small intestine tissue. ICC/IF: Human esophageal epithelial cells. Our Abpromise guarantee covers the use of ab6328 in the following tested applications. WB Use a concentration of 1 - 5 µg/ml. Concentration of IST-9 in IHC-fr - depending on the system - is 0.1 to 2 micrograms per ml. IST-9 works very well using all iHC-fr procedures. IHC-P 1/100 - 1/200. Perform enzymatic antigen retrieval before commencing with IHC staining protocol. 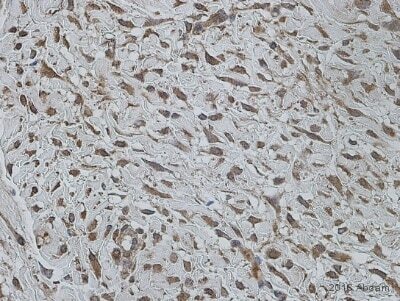 Concentration of IST-9 in IHC-P is - depending on the system - 2-10 micrograms per ml. Immunohistochemistry (Formalin/PFA-fixed paraffin-embedded sections) - Anti-Fibronectin antibody [IST-9] (ab6328)Amann et al PLoS One. 2014 Mar 24;9(3):e92511. doi: 10.1371/journal.pone.0092511. eCollection 2014. Fig 3. 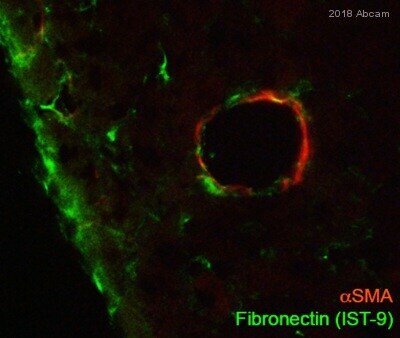 Fibronectin was displayed in microtissues after ten days. (Bar in A549/SV80 monocultures: 50 μm, bar in all other microtissues: 100 μm); Secretion of fibronectin could be observed in microtissues containing fibroblasts, whereas in all tumour cell monocultures no fibronectin secretion could be detected. Immunocytochemistry/ Immunofluorescence - Anti-Fibronectin antibody [IST-9] (ab6328)Gligorijevic et al PLoS Biol. 2014 Nov 11;12(11):e1001995. doi: 10.1371/journal.pbio.1001995. eCollection 2014 Nov. Fig S3. Correlation of blood vessel diameter and blood vessel coverage with ECM components. (A–D) Blood vessels were visualized by endomucin (green) and coverage of the blood vessel was measured using laminin (red) (A), collagen I (B), fibronectin (C), and collagen I (D). Scale bar: 50 µm. Western blot - Anti-Fibronectin antibody [IST-9] (ab6328)Image courtesy of Dr Mahesh Shivananjappa by Abreview. ab6328 positively staining paraffin fixed canine myocardial infarct. tissue (1/200). The images demonstrate the time course of fibronectin deposition in reperfused canine myocaridal infarcts. c: 28 days of reperfusion. Secondary: Biotin conjugated goat anti mouse. Detection was achieved using DAB. 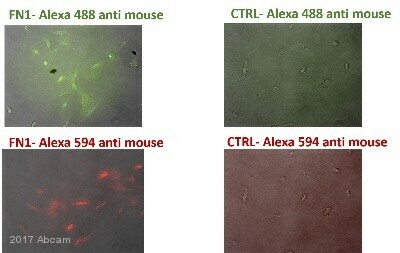 This image is an edited version of an image submitted courtesy of an Abreview by Marcin Dobaczewski. We do not have any further information relating to this image. Formalin fixed paraffin embedded rat kidney stained with ab6328 at a dilution of 1:100 after proteinase K digestion. The image was kindly supplied as part of the review submitted by Elizabeth Chlipala. ab6328 staining Fibronectin in human small intestine tissue sections by Immunohistochemistry (IHC-P - paraformaldehyde-fixed, paraffin-embedded sections). Tissue was fixed with paraformaldehyde and antigen retrieval was by heat mediation in a Tris-EDTA buffer pH 9.0. Samples were incubated with primary antibody (1/50 in blocking buffer) for 30 minutes at 20°C. An undiluted HRP-conjugated Goat anti-mouse polyclonal was used as the secondary antibody. ab6328 staining fibronectin in human esophageal epithelial cells by ICC/IF (Immunocytochemistry/immunofluorescence). Cells were fixed with PFA, permeabilized with 1% Triton X-100 in PBS and blocked with 0.25% serum free protein blocker for 20 minutes at 28°C. Samples were incubated with primary antibody (1/100) for 2 hours at 28°C. ab6785 (1/800) was used as the secondary antibody. This photo shows Fibronectin localization in the extracellular matrix of monolayer culture of human esophageal epithelial cells (Het-1A). Nuclei were counterstained with propidium iodide. Publishing research using ab6328? Please let us know so that we can cite the reference in this datasheet.